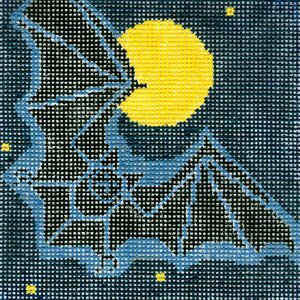 A Charley Harper needlepoint called BAT is small and perfect for any season. The design is hand painted onto 18 mesh mono needlepoint canvas and measures 4" x 4". This Charley Harper needlepoint is sold canvas-only or as a kit. We use DMC cotton floss or Bella lusso wool or pepper pot silk for this 18 mesh canvas. If you wish to purchase stretcher bars we recommend two pair of 8" bars and some thumb tacks. This Charley Harper needlepoint canvas usually ships in 10 days. You can always check availability before you order.